Sweethearts since childhood, Ellie Hogan and her husband, John, are content on their farm in Ireland--until John, a soldier for the Irish Republican Army, receives an injury that leaves him unable to work. Forced to take drastic measures in order to survive, Ellie does what so many Irish women in the 1920's have done and sails across a vast ocean to New York City to work as a maid for a wealthy socialite. Once there, Ellie is introduced to a world of opulence and sophistication, tempted by the allure of grand parties and fine clothes, money and mansions...and by the attentions of a charming suitor who can give her everything. Yet her heart remains with her husband hack home. And now she faces the most difficult choice she will ever have to make: a new life in a new country full of hope and promise, or return to a life of cruel poverty...and love. This is a hard book for me to review because I really felt there were two sides to it--the Irish side and the American side. The book's main character is Irish and the story begins in Ireland, and I loved that part of the book. Kerrigan brings to life the struggles of the Irish under British rule in the early 1920's. I fell in love with both Ellie and John as their relationship progressed and, by the time Ellie left for America, I was completely engrossed in the book. But that is here the book turned for me. Kerrigan's New York just doesn't seem real. Instead, it seemed like the New York of a 1950's movie musical, where everything was fun and gay. 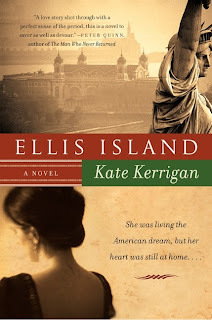 I don't think that I am alone in knowing that life was not so easy for immigrants at that time (or, well, ever really....) Indeed, Ellie has an almost unbelievably charmed life in New York for a 3rd class Irish immigrant. For me, it was almost unbelievable. And the New York characters were just unrealistic. Isobel, Ellie's employer, is a nothing but a copy of Daisy Buchanan and even the "charming suitor" was an empty shell of an idealized rich American. Even though I was disappointed with a large portion of this book, the Irish angle hooked me enough to keep me going to the end, as well as to add the sequel, City of Hope, to my TBR list. I guess Ellie Hogan is worth a second chance. Interesting... I probably would have picked this book up due to the Irish/American story-line. I loved, loved, loved Frank McCourt's memoir Angela's Ashes and would have expected something along those lines, I guess. I too would have been disappointed with the unrealistic New York. It begs the question... what historical fictions do you LOVE?